A study in warm browns and greys. The rustic bricks really work in this painting, each has its own pallette of colours, from purpley bluey grey, through reddish brown to pale cream. 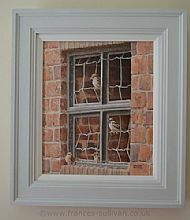 These colours are then picked up in the wire, window frame and birds, with the pale grey frame harmonising the whole. 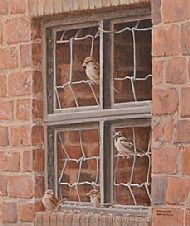 I aimed for an interesting grouping of these House Sparrows as they flitted in and out through the window, and they arebeautifully highlighted by the sun. Creating a warm and harmonious painting of these increasingly rare birds.